Maharashtra, Aug 30: Right to Information (RTI) activist from Nanded was found dead under mysterious circumstances. Ramdas Ghadegavkar was also a Shiv Sena leader and the head of the district Milk Sellers Association. Police in Nanded, about 650km from Mumbai, registered a case of “sudden death", after 43-year-old Ramdas Ghadegavkar's body was found. Ghadegavkar had exposed the thriving sand mafia in the region through the RTI act and had lodged a complaint reporting the same. His complaint had also led the district administration to initiate action concerning the issue. Ghadegavkars death comes soon after the murder of another RTI activist Amit Jethwa from Gujarat who was knocked off for blowing the whistle on illegal mining in the Gir forest region. Shiv Sena party workers have demanded a CBI inquiry into his mysterious death. Rafale: Explained, can RTI override the Official Secrets Act? Can RTI be filed online? Does this apply to NRIs? 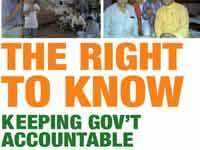 Monsoon Session: Does govt want to amend RTI Act?